Mazzoleni is pleased to announce its autumn exhibition ‘LIGHT IN MOTION: Balla, Dorazio, Zappettini’, which will explore shared themes in the work of three major Italian artists working throughout the 20th century, Giacomo Balla (1871–1958), Piero Dorazio (1927–2005) and Gianfranco Zappettini (b. 1939). Curated by Elena Gigli, the exhibition will bring together key works by each artist to demonstrate their shared mastery of light, colour and perception during three pivotal moments in Post-War Italian art, Futurism, Lyrical Abstraction and Pittura Analitica. The exhibition will include over a dozen works on loan from private collections, never before exhibited in the UK, and will be accompanied by a fully illustrated catalogue with essays by Elena Gigli, Mirta d'Argenzio, Alberto Rigoni. Giacomo Balla, whose work was recently the subject of a major exhibition at the Estorick Collection, was a key proponent of Futurism. An original co-signatory of Marinetti’s Futurist Manifesto, signed in Milan in 1910, Balla was a pioneering figure of European Modernism. His work influenced many artists between the late 19th and early 20th centuries, with its characteristic preoccupation with new technology, speed, movement and light. 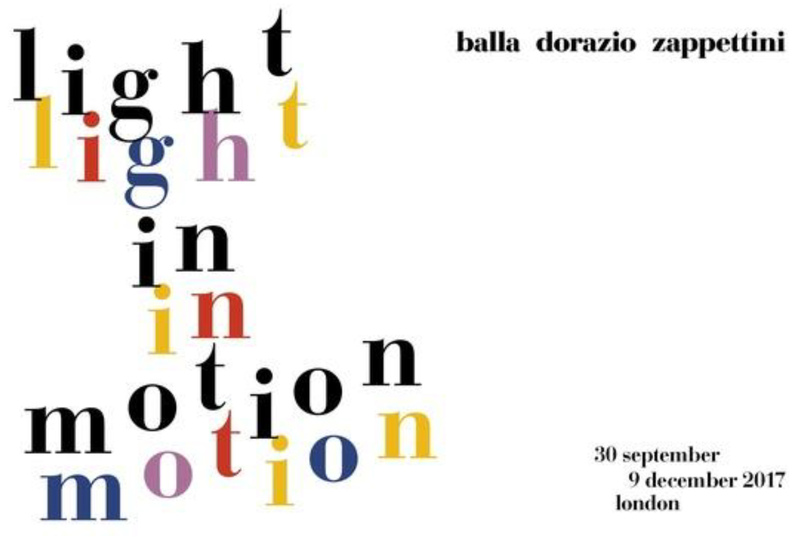 Balla’s work would eventually spark the interest of even younger artists such as Piero Dorazio, some 60 years his junior, who would not only develop a personal friendship with Balla but would also explicitly pay homage to the artists of the Futurist movement through the titles of his works. The pair became friends in the 1950s and Dorazio created a revival of interest in Balla’s work in the last years of his life. Specifically, it was Balla’s ‘macro-group’ works, Compenetrazioni Iridescenti, which translates as ‘iridescent interfaces’, that captured Dorazio’s imagination and prompted his own foray into the tangibility of light and perception. In the 1970s, Gianfranco Zappettini became a key figure in the emergent Pittura Analitica movement, which sought to redefine painting for the modern era and reclaim the form as a contemporary communicator. Zappettini and his contemporaries were concerned with the materiality of painting, and sought to expose the operative and analytical practices attached to different materials. Zappettini often uses building materials and thread in his paintings, meticulously exposing the medium to create his signature, illusionistic compositions.